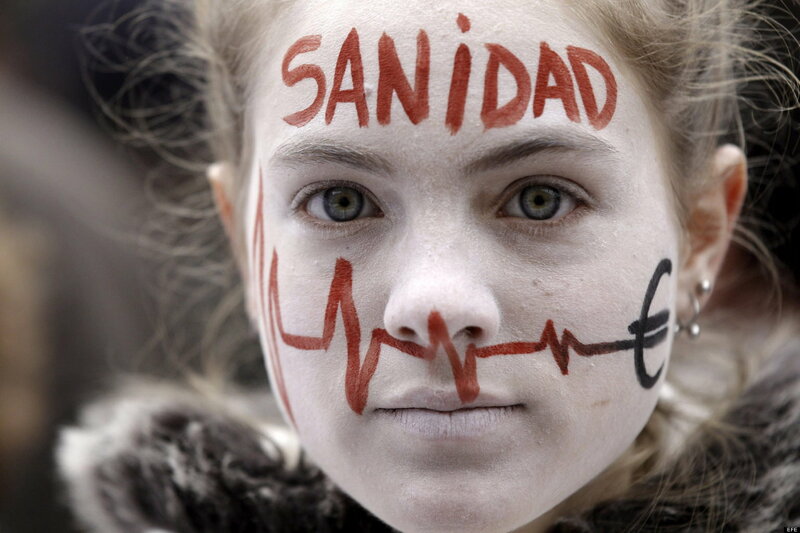 On the 17th of February, over half a million people took to the streets of spain’s cities in a protest against cuts to the budget of the country’s public health services. It was but only the most recent example of a protest organized by the marea blanca, the “white tide” against government cutbacks in the area. It includes all categories of workers in hospitals, clinics, and laboratories. And the protests have taken a variety of forms (egs. street demonstrations, strikes, occupations) and have been organized in open assemblies by workers and users of the health care system, on the margins of more formal, existing union structures. The marea blanca is, in turn, only a recent example of a number of other mareas. The marea verde, which began with primary and secondary school teachers in the Madrid region, and which quickly spread to other cities, was the first such expression, to be followed by mareas azul, roja, violeta, naranja, amarilla, negra, and the like. Emerging in the wake of spain’s 15M, and initially often in Madrid, they all share similar forms of organization and concerns. Internally, they are organized by assemblies with the ambition of having decision taking bypass labour union hierarchies, as well as the division between those who dispense the services and those who benefit from them. It has been suggested that the mareas point to an alternative form of labour organization. They are not essentially concerned with wage demands, but largely with protecting and securing public services and the rights they respond to, against government austerity policies. They accordingly go beyond exclusively professional concerns, and reach out to the broader society. They also openly contest government, political party and union leadership powers, actively defending more democratic ways of controlling the services provided. And in an effort to bring all of the mareas together, a nationwide protest, under the name of marea ciudadana, has been called for the 23 of February. Impressive though these movements are, there are equally haunted by limits which are disturbing. Most of the mareas are driven by civil servants (the marea violeta, an outgrowth of the 15M Madrid feminist group, the marea azul, concerned with the privatization of water, initially in Madrid, and the marea roja, an organization of the unemployed, are exceptions, but they have also had far less resonances in Spanish society) and their example has not been followed in the private economy. And though they have sought to bypass existing union structures and professional interests, they have not always in fact succeeded in doing so. Furthermore, all of the mareas call upon government to fulfill their obligations to provide for certain rights of citizenship. Their efforts to create alternative political realities are modest by comparison to their desire to defend what existing or recently existing state social services. Their aspirations in other words do not put into question the welfare state, its hierarchical forms of administering human well being, the dependence of such a state on national capitalist forms of government and its collusion with system complacent labour unions (the marea ciudadana’s manifesto, with its vague calls for social justice may be taken as emblematic of this). They remain trapped in a logic of capitalist growth which completely ignores the limits of State-Capital itself. This is nowhere more evident than in the absence of any general critical discussion of what education, what health or social services are to be defended, as if their state administered forms were an end in themselves. It would be ridiculous to silently stand by the destruction of the welfare state, itself the consequence of past struggles. And there is enormous potential in the idea and organizational forms of the mareas. But to remain trapped in a discourse of citizenship and national well being is also to diminish the enormously radical potential unleashed by 15M, a potential exemplified in the creation of a diversity of spaces not of citizenship, but of autonomy. This entry was posted in Commentary, News blog and tagged 15M, labour, spain, Spanish Revolution. Bookmark the permalink.